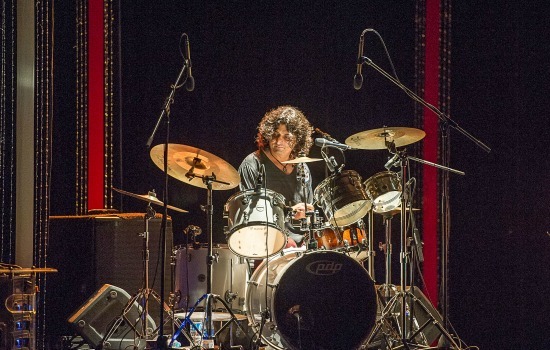 Indian Ocean, a contemporary fusion rock group from New Delhi kicked off their tour in Egypt with two concerts at El-Gomhouria Theatre and Ain Shams University on 25 and 26 April respectively. The band is set to perform next in Ismailia’s Beach Club (28 April), before making a last stop in Alexandria on 30 April where they will perform in Bibliotheca Alexandrina. The band’s performances come as part of the fourth edition of the India by the Nile festival , an annual festival which brings contemporary and classical Indian arts, wellbeing techniques, food and other insights into Indian culture to an Egyptian audience. This year’s edition commenced on 23 April and runs until 7 May. Friendly vibes and a profound chemistry characterise the relationship between Rahul Ram, Amit Kilam, Himanshu Joshi, Tuheen Chakravorty and Nikhil Rao, the five musicians on the band’s current lineup. When travelling abroad these days, they bring their manager, sound and light engineers along, travelling like a big Indian family. During the 25 years of the band’s history, the Indian Ocean has held many performances around the globe, including in Russia, New Zealand, USA, UK, Japan, Australia, Indonesia, Canada and even Reunion Island, but they have yet to explore Egypt. One of the early impressions for the band was the strong, black Egyptian coffee. The 25 April concert started with a folk song from South India and continued with a piece based on a classical poem by 15th century Indian mystic and poet Kabir. In their repertoire, one will encounter Christian hymns from Kerala as well as songs to lyrics by contemporary poets. 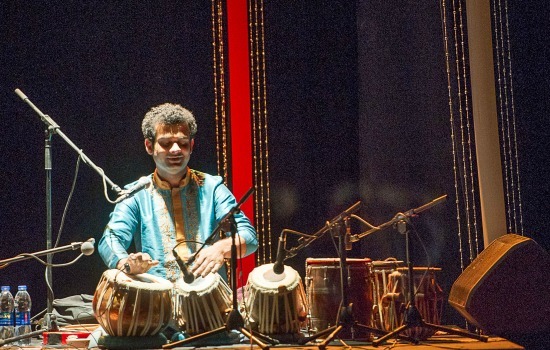 The vocals are distinctively Indian, the instruments are mostly Western, the rhythms go from traditional to modern, and somewhere in between lies a formula of music that stays fresh and appealing for generations of listeners. "There is this old style fusion where Western and Indian musicians force themselves to come together, and then the same tune would be played in Western style, then followed by an Indian style. We never wanted it [this way]”, says Rahul Ram, the group’s patriarch. Instead, the band offers a different recipe for what they call “a proper fusion,” which according to them boils down to the right people gathering in the right place and letting the music grow naturally. “We just jam together and then something comes up." 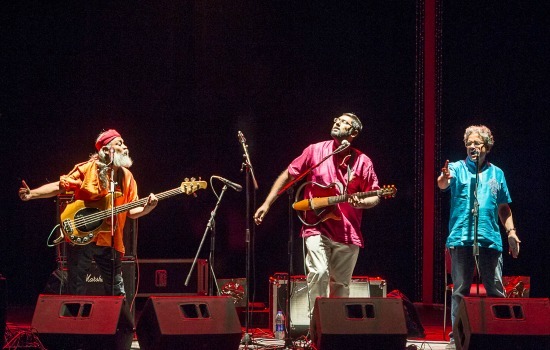 Indian Ocean’s most recent albums were the soundtrack to the film Masaan (2015) and Tandau (2014), which included a collaboration with seven artists. Prior to that they also released an album titled 16/330 Khajoor Road, named after a house in Karol Bagh where many jams and albums have been unfolding since 1997. Can it be asserted that the band is playing contemporary Delhi folk music? “Yes, that is a nice way of putting it,” agrees the band’s drummer Amit Kilam. A recent socially influential tune by the band is the anthem of Clean India Mission, a government-sponsored campaign that aims to clean India’s cities. The song titled "Banega Swacch India" was requested and pushed to popularity by Dettol, a hygiene products company. “We had an opportunity to participate in it as musicians and to collaborate with a lot of friends." In the video the anthem is sung line by line by popular Indian musicians, like Shilpa Rao, Agnee, and Euphoria. Other than that, the band has also worked on songs addressing a wide range of issues such as displacement, and communal violence between Hindu and Muslims. Back in 2007, Indian Ocean composed the soundtrack for "Black Friday," a controversial Bollywood movie centred on the Bombay bombings of 1993, with the song “Bandeh” becoming a long-lasting hit. "We are not a band which makes a song for every social occasion, and we are not preaching about anything. We just make songs about what we actually feel. Our songs have very basic and general messages, like “people have to be nice to each other," but then people attach it to some social context that is relevant for them at the moment. People call some of our songs ‘Sufi’ [for example.] Actually they are not Sufi, but we don't mind," shares Amit. With all the successes under their belt, they continue to dream. "I would like to play a concert in South America!" says Rahul. "I want us to collaborate with Carlos Santana," suggests Tuheen. "I would like to settle with music, without having to divide time between filmmaking and singing," wishes Himanshu Joshi. Amit is looking forward to international collaborations, including some with Arab singers, and Nikhil is planning to study oud during his stay in Egypt. Later this year Indian Ocean are planning to celebrate their 1000th performance by recording a complete live concert album. 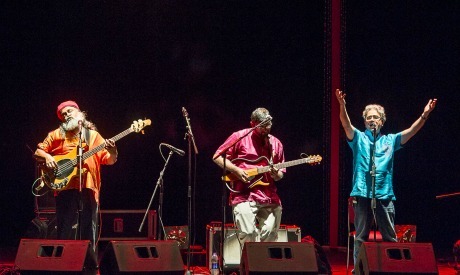 The road leading to this anniversary was not smooth all the way, as the band has worked for years without recognition, and also witnessed the demise of one of its founders, vocalist and percussionist Asheem Chakravarty, and the departure of the guitarist Susmit Sen, another pillar of this structure, for a solo career. But persistence gives its fruit. With Himanshu Joshi joining with vocals, Tuheen Chakravorty with percussion and Nikhil Rao as a guitarist, the group keeps on going well. “We are a brand. We have 450,000 followers on Facebook, the manager Dhruv Jagasya states proudly. “When I go and speak to a brand, I talk not about sponsorship but about partnership with us,” he adds. But this didn’t come overnight. Rahul Ram stressed how a musician’s path can be filled with challenges, and is one where you hardly make any money for many years. He believes however that one should stay passionate.